Cloth diapers aren't what they used to be. We've talked to lots of friends who have tried cloth diapering, and it seems that each of them used a different brand. Clinton and I chose gDiapers, one of the many varieties of contemporary cloth diapering systems. gDiapers are a cloth and disposable hybrid. They consist of a cloth outer "gPant", and a snap-in nylon liner, which holds either gCloth or gRefills disposable inserts. The gPants come in a variety of bright colors, cute patterns, and are available in a multitude of sizes to fit babies from birth through potty training. The nylon liners and inserts come in sizes to match the growing gPants. To determine which gDiapers your baby should wear, simply follow this guide and, and order away! 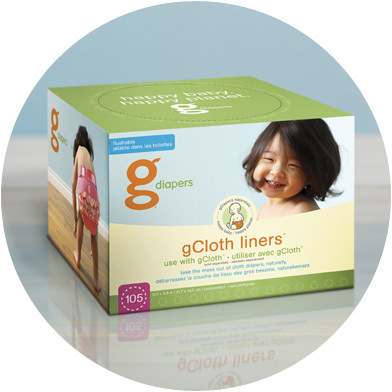 With gDiapers, you get the best of both worlds: cloth and disposable. You can choose to use one, the other, or a combination of both. If you choose to use gRefills, you have the piece of mind knowing that your baby's diapers won't be taking up space in a landfill somewhere, because they're 100% biodegradable. Don't want to compost your gRefills? No problem! You can flush 'em down the toilet, and they'll dissolve and leave nothing behind to clog your commode. Even if you're not a "green" family, you simply can't ignore the cost savings that cloth diapers can produce. Want to calculate your diapering impact? Head on over to gDiapers website and use their diaper calculator to see how much you're wasting just by tossing 7 diapers a day for 2.5 years! After deciding to go with gDiapers cloth diapers, I ordered the "gBaby Bundle for Newborns", which is available on gDiapers' website. The Newborn bundle comes with 12 size "Tiny" gPants, 6 size "Small" gPants, and 80 disposable inserts. If you want cloth inserts, you have to order them separately. Buying by the bundle is a bit cheaper, though not significantly. You can also purchase gDiapers from Babies R Us, in 2-packs, though they don't offer bundles. We've also found that Babies R Us puts gDiapers on sale often, and that's the best time to buy. Additionally, diapers.com sells gDiapers, and you get a 20% discount for the first three months that you're a member. Diapers.com also offers free shipping, and automatic shipping. So, if you decide to use the disposable inserts on a regular basis, you can have them shipped right to your door, so you never run out. After Lucas was born, the Newborn gDiapers didn't really work for us. Because Lucas is Breastfed, he would just leak through the diaper and soil the outer gPant every hour to hour and a half, and each time he nursed. gDiapers recommends that you use disposable inserts for Newborns (as opposed to gCloth), because of the messiness of just-born baby diapers. While the convenience of flush-away liners was nice, I still had wet and poopy gPants in the laundry. Even when we used the disposable liners, had the correct fit, and changed Lucas often, we still had issues with blowouts and leaks. I made an executive decision to hold off on using the gDiapers until Lucas' digestive system matured a little bit, and so we switched to disposable diapers. The one down-side to gCloth is the amount of work it takes before you can use them. You absolutely must wash and dry the gCloth inserts a minimum of six times (without detergent) before first use. I'd say you can cut some corners and skip this step, but I'd be lying if I did. The Handy User's Guide (HUG) that comes with your gDiapers outlines instructions of exactly what to do before you get started using your gPants. If you choose to use gDiapers, please take the time to read the care instructions, as it will truly extend the life of your diapers, make them more absorbent, and create a lot less hassle down the road. At about 4 weeks, we were able to begin using the size Small gPants with cloth inserts. Lucas' digestive system had matured enough that his diapers weren't so messy, and he was going less often. Using cloth does mean more frequent diaper changes, about every 1.5 hours while your baby is awake. There are many ways to store soiled diapers. I would simply spray each wet gCloth liner with Baby Stain Spray, and toss it in with his regular laundry (separate from mine and Clinton's). If necessary, I'd run a poopy diaper through a rinse cycle first, and then wash it along with the rest of his load. If only the gCloth insert was soiled, I re-used the gPant and liner. When it came to the gDiapers, I used the six size "Small" gPants that came with my newborn bundle, and ended up purchasing some additional. All together, I ended up with 10 Small gPants, 16 nylon liners, and 24 gCloth inserts. With this, was able to do one load of laundry every-other-day. The most important part of ensuring success with gDiapers is fit. If the diapers don't fit right, you'll end up with a leaky mess every time. I suggest watching the video and practicing on a stuffed animal several times before your baby is even born. As a stay-at-home mom, I was able to use gCloth all day long and in the evenings. For short trips, I would use the disposable liners in the gPants, and Huggies Pure and Natural Disposables for trips that were two-days or longer. Lucas was able to wear a size Small gDiaper until he was about 4 months old, at which time he weighed about 14 pounds. Lucas was a long and thin baby at 4 months, otherwise he would have outgrown the Small size sooner. Even though Clinton and I included gDiapers on our baby registry, no one purchased them for us. At first glance, the gDiapers system appears to be enormously expensive, and extremely complicated. We received a slew of "regular" diapers, in spite of us informing people via word-of-mouth that we were planning on using cloth. I wish that we had included cards in our shower invitations explaining what we wanted to do, but I felt bad expecting people to make such a large investment. However, after Lucas' sensitive skin prohibited us from using all of those diapers we were gifted, I felt even worse! If you are looking forward to using gDiapers for your baby, and want others to purchase them for you (in lieu of "regular" disposable diapers), my advice is not to hesitate informing people of your choice. If you do the math, one package of gCloth inserts costs about as much as a jumbo pack of disposable diapers, but will last much, much longer! gDiapers now offers a pre-designed card that you can print and include in your shower invites, asking people to purchase gDiapers! Click here to open their shower invite in a new window. If you are purchasing, or asking others to purchase gDiapers for your baby, price tag shock can be a real bummer. When we purchased Lucas' size Medium set with gCloth inserts, we spent around $225.00 for the entire system. When you compare this price to the Huggies Pure and Natural disposable diapers, at 10 diaper changes per day, it would only take about two months for the gDiapers to pay for themselves! And unlike disposable diapers, you can wash and sanitize gDiapers for use with future children. So, aside from the cost to wash and dry the gDiapers, they're essentially free for baby number two! How's that for economical? !